An urgent operation is being prepared to free a remote Arctic town currently besieged by dozens of polar bears. Officials are planning to sedate up to 52 predators terrorising the settlement of Belushya Guba on the Novaya Zemlya archipelago where they are “chasing” locals and behaving aggressively. Then the animals will be transported a long distance away from the town – but critics of the scheme warn they could rapidly come back. 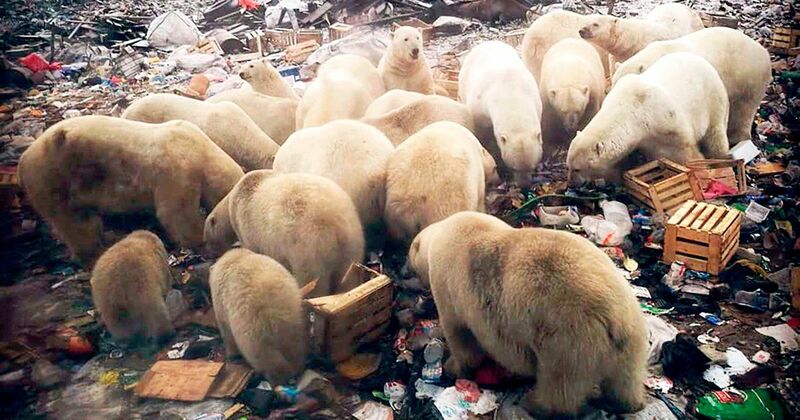 Extraordinary pictures and video show the settlement in terror from the polar bears which stalk apartment blocks and scavenge at dumps. The head of the local settlement said that Russia’s nature conservancy agency Rosprirodnadzor – which bans slaughtering the endangered wild animals – is sending a team to the remote islands to sedate and move the animals. Zhigansha Musin said: “We have introduced a state of emergency in the settlements for an unlimited time. “We asked Rosprirodnadzor to provide us with people. “They will catch the bears. The predators will be put to sleep and taken out of the settlement. “We will not shoot them. The operation to clear the town of polar bears should begin within days after the specialists fly in tomorrow, he said. On Sunday his deputy Aleksandr Minayev warned that residents are ‘afraid to go outside’ and ‘daily life is in turmoil’. “Parents are wary of letting children to go to schools and kindergartens,” he said. Footage shows the bears entering apartment blocks. But a WWF expert in Russia blamed the country’s defence ministry – which controls the territory around the settlement – for failing to act sooner. And he forecast the plan to move the bears would end in disaster. “Everyone knew this might happen,” said Mikhail Stishov, WWF coordinator for Arctic biodiversity projects. “There are many more polar bears on shores because of lengthy absence of ice. Archipelago authorities had known a problem was coming, he said. But the Defence Ministry earlier banned WWF experts from visiting the restricted military area, he said. He warned: “It’s not at all cheap and easy, to sedate and move them away. “We have to transport them really far, because if we just take them some 20, 30 kilometres they will be be back very soon to an area which they know has food. “So we are talking about a minimum of a two or three hour flight to the other side of the island. “And of course it will be next to impossible to move all 50 bears. But if the scientists identity a pack of leaders, or the most daring bears, then taking just them away might be worth trying. Alexey Kokorin, head of the WWF climate programme, said: “These are males, because females and cubs are hibernating. “But in fact both males and females see humans for just one thing – food. ‘I think there is no other animal like polar bears that so deliberately chases humans. The animals are ‘literally chasing people and even entering the entrances of residential buildings’. Russian laws forbid the slaughter of polar bears except in specific cases where they attack humans. The besieged town is five miles from a Russian military base. Some experts say climate change is to blame for the bears behaviour – because the ocean is no longer frozen.